Recently, I was lunching at Chez Panera when I got rubbed the wrong way. No, it wasn’t you, Phoebe the Cashier – you’re aces in my book. It was the guy who asked for a cup of water and then filled with Dr. Pepper at the soda dispenser. His poor choice in soft drinks aside, who does that? The guy buys a $12 lunch and he thinks it entitles him to free soda, six ounces at a time? Seriously, who are these people? After a few dozen head shakes and eye rolls, my thoughts turned – as they inevitably do – to social media. What are some of the ballsy, unethical or just plain rude techniques employed on various social media platforms? What rubs me the wrong way? What pisses me off? Auto DMs. All of them. Without exception. Private conversations held in public forums. Just because I’m Facebook friends with two girls from high school doesn’t mean I need to see the back-and-forth of their Friday night planning. Calling yourself a “guru,” “ninja,” or “tsar.” (Oddly, “czar” is ok). Emoticons. If you can’t say what you mean with words, it’s not worth saying. Repeating the same message over and over again. If I wanted to hear a broken record, I’d own a record player…and records. Yeah, I’m going to have to come up with a new metaphor. Outdated technology metaphors. This list is crashing like my Treo 650…am I right, folks? Debating politics on Facebook. No one has ever changed his or her vote because of a well-worded wall post. An avatar that’s a cartoon version of you. Hey, I like Mad Men and the Simpsons as much as anyone, but my avatar is my real-life obnoxious face for a reason. An avatar that is from 15 years and/or 85 pounds ago. This isn’t online dating. An avatar that has someone else in it. An avatar that has someone else poorly cropped out of it. Really? You can’t find *one* decent headshot? Misunderstanding your network’s privacy settings. I’m looking at you, Randi. Abusing #hashtags because you #think they’re #fun. They’re #not. And you’re not #cool. Asking for RTs all the time (every once in a while is cool, but don’t be the boy or girl who cried wolf). Side note: please RT this post! Deleting your mistake in the hopes that no one saw it. This is the internet. Someone saw it. And screen capped it. And now that mistake has been posted somewhere else. Sorry. Unfriending or disconnecting in the heat of the moment. Even with an ex. Mistaking social media buzz for a verified news source. Consuming without adding to the discussion. Read an interesting blog post? Add a comment (hint, hint). Yesterday, Twitter had a well-publicized downage, causing many discombobulated social media addicts to step away from their smartphones and catch a rare glimpse of that yellow ball of hot light in the sky. 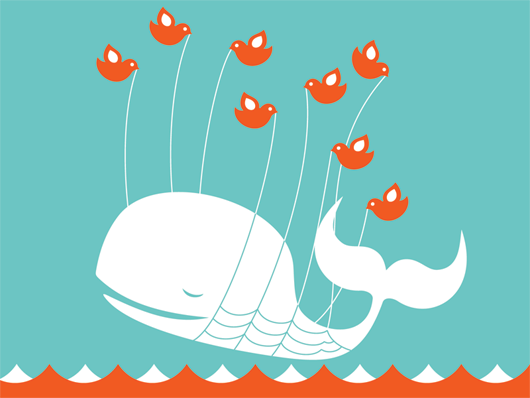 Needless to say, #whiletwitterwasdown quickly became a trending topic and speculation was rampant about how and why such a devastating “epic fail” could happen. While the official story is that the two-hour outage was caused by a “noteworthy” double failure in Twitter’s data center, I can smell a ruse a mile away. You see, friends, Twitter’s data center is functioning perfectly. I know this because I know what really happened. Twitter is covering up the real culprit: me. Yesterday morning I tweeted a note about JC Penny’s Foursquare promotion that will donate $1 to the USO for every check-in through July 31. As you’d expect when social media titans collide (a major retailer, the world’s largest location-based application, a nationally-renowned charity and yours truly), the ReTweets came faster and furiouser than a Vin Diesel car chase. That’s 32 (and counting) RTs in one day! Though I have no quantitative proof, I have it under good authority that I smashed Twitter’s RT record. The people from the Guinness Book are on their way over. Mr. Ripley has left several voicemails. I’m kind of a big deal. In all seriousness, one seemingly innocuous tweet reached nearly 50,000 people, which *is* a big deal for someone with “only” 582 followers. While my tweet was merely intended to call attention to the meeting of two subjects about which I am passionate (social media and philanthropy), my name, brand and ideas were suddenly in front of thousands. Pretty cool, huh? The takeaway is that whether you believe Twitter is a broadcast medium, a two-way conversation mechanism or simply the quickest way to stay in touch with what’s happening around our increasingly small world, using it to share your passions – while sourcing your content and giving shout-outs as appropriate – can yield surprising benefits. I’ve picked up a bunch of new followers in the past day (approximately 2% of my total followers). And, let’s not forget, the huge Klout bump I could expect from having my Tweet shared all over the interwebs. Last week, I went on a family vacation in Antigua. Since I’m a hopeless social media addict without an international iPhone data plan, I panicked – logically – about being disconnected from all my online personas. While I knew HootSuite would allow me to pre-schedule Twitter, Facebook and LinkedIn posts before leaving the country, what about my location-based check-ins? Why wasn’t there an app that would allow me to schedule a check-in before arriving at a specific location? That’s when I discovered Forecast, a service that bills itself as “a fun and simple way for friends to share where they’re going.” Not only would the application allow me to check in via Foursquare at a place and time in the future, but it would push check-ins to Twitter or Facebook with the click of a button (loyal readers – hi mom! – know I’m not a fan of this practice, but it is occasionally relevant). On February 28, I scheduled a check-in for March 9 – a time I expected to be out of both cell and data range. I scheduled the update to be pushed to Twitter. And it was…on February 28! Can you think of a less relevant Tweet? 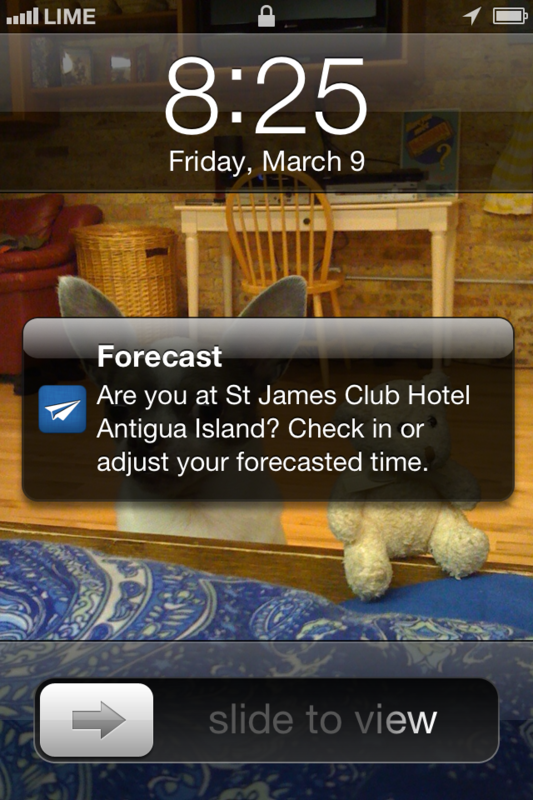 If Forecast can schedule my check-in for a specific time at a specific place, shouldn’t it also be able to synch the corresponding Twitter update? 2. It’s Mobile-Based Only – while scheduling check-ins on-the-go is a convenient feature, why can’t I schedule them from my laptop as well? Forecast’s non-mobile display is a largely blank and aesthetically unpleasant display; why did its developers ignore static users? Instead of automatically checking me in to my location, Forecast asked me if I was actually at the location…then it required me to open the app to verify my location…and only then would it actually check me in! Without data (which I purchased midway through my trip) or Wi-Fi, I would never have received this notification, and thus, would never have been checked in. If I want a reminder to check in to specific locations, it’s much easier to use my native Calendar app than it is to program through Forecast’s bulky interface. 4. It’s All Sizzle and No Substance – with esteemed authorities like Mashable promoting the service as one of the “Hot Apps to Watch at SXSW 2012,” Forecast should have something new to offer. But hey, why develop your product when you can just hire a good publicist, right? To Forecast’s credit, I Tweeted a complaint about problem #1 and received an @ reply within minutes. But a responsive community manager isn’t enough to smooth over the inherent flaws in Forecast’s platform (especially since I was asked for recommended changes and then never heard back from said community manager). 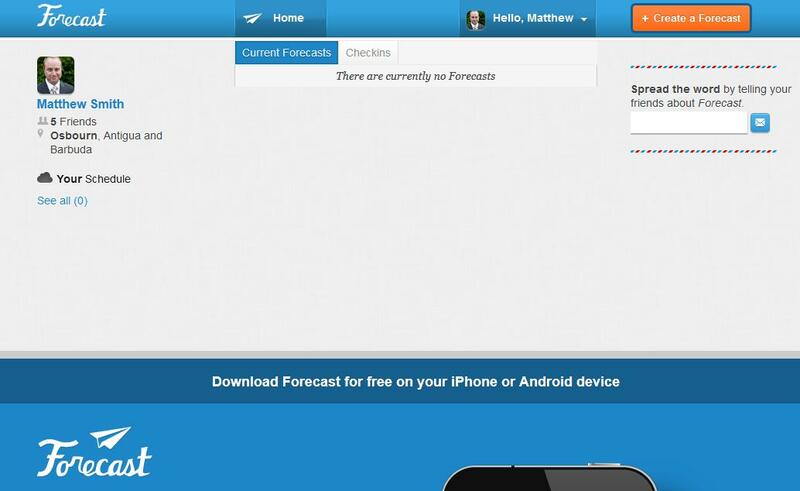 Forecast is an interesting idea with the potential to become a valuable service. But until its designers undertake some substantial remodeling, I’m afraid it will remain an unFOREtunate and largely FOREgettable application. Ugh. Word play. Please FOREgive me. Is it Ever OK to Share your Foursquare Check-in on Twitter? Yesterday I posted a rather lengthy diatribe about the over-sharing of foursquare check-ins across social media networks. My point was that there is no reason to cross-share a majority of 4sq check-ins on Twitter or Facebook. In fact, I think that most of the time, doing so is both rude and redundant. You’re at a conference, class or event – yes, apps like Sonar will help you find and meet other attendees, but if your network may have a legitimate curiosity about where you are and why you’re there, I say share away. You’re somewhere relevant with someone relevant – you don’t have to be doing something interesting to warrant a 4sq check-in, but we’ve already covered why those activities need not be shared. Do something WITH someone interesting, however, and almost any mundane activity becomes pertinent for others as well. There’s swag at stake – many businesses give perks to customers who check-in on foursquare; often, you simply have to show your phone to a staff member and the freebie is yours. However, some businesses demand to see that you pushed your check-in to your Twitter or Facebook feeds. Though your friends may suffer from your oversharitis, anything goes if it nets you a free appetizer. That’s it. Your home, office and/or favorite coffee shop – lambasted yesterday for stupidity of shared check-ins – may even apply. Just use your head, a sense of decency and remember that your social media activity should always be personal, never automatic and as relevant as possible to people not walking in your shoes. Don’t get me wrong – I like Foursquare. Hell, I even use Foursquare (to excess). I simply don’t understand why people feel the need to share their check-ins across multiple social media outlets. I’m so fired up about this that I feel the need to explain how you may be using Foursquare incorrectly…and how to change your evil ways. Your office – yeah, I know where I can find you during normal work hours – it’s printed on your business card. Unless your employer uses Foursquare in lieu of a time clock, spare us the update. It’s interesting to see when John and Jane Q. Public come walking in your business’s door; it’s pointless when Ted from Accounting shares his cigarette break comings and goings. Starbucks – got a craving for a half-caff nonfat venti cappuccino? No one cares. Your daily errands may help build your Foursquare score and clout with businesses, but who’s so arrogant as to think their contacts care? If your check-in is all about you, best keep it to yourself. Your house – how desperate are people to “game” the Foursquare system that they create a location for their homes and check in every time they walk through their front doors? Before Foursquare recently changed their privacy settings for residences, I was fond of checking into obvious “home” locations and posting statuses like “going through the underwear drawer” or “nice Bieber memorabilia!” What can I say? I’m a class act. Perhaps you think I’m missing the point about Foursquare. Sharing check-ins is a great way to build commonality across networks, meet new friends and learn what’s happening to contacts in real-time. Here’s the thing: I’m not missing it. I get it completely. You can utilize Foursquare perfectly and still not be an annoying, over-sharing attention whore. Is there any reason someone would WANT to know about this check-in? Am I connected on Foursquare to the people whose knowledge of my check-in I so desperately care about? Why or why not? How will people find out about something important if I don’t share it? If no one has a reason to care, it should be pretty clear that your check-in doesn’t need to be shared. If you believe they may care, invite them to connect with you on Foursquare. That way, every one of your check-ins can be accessed without overwhelming all of your connections’ timelines. If they don’t choose to connect with you, they’ve told you they don’t care. The last question should steer you in what I believe is the direction best suited for location-based social media. You can still build your network through shared experiences – amongst friends and random strangers alike – without pushing pointless updates across platforms. I do so with Sonar – a mobile application that uncovers the hidden connections shared with nearby people. Linked to my Foursquare, Twitter, Facebook and LinkedIn accounts, Sonar tells me when I’ve checked into the same location as another contact…or when I’ve checked in to the same place as someone I may/could/should know (“Jane has also checked into Whole Foods. You share two Twitter connections. View her profile here”). Best of all, Sonar runs unobtrusively in the background of my iPhone and pushes me relevant notifications without bothering anyone else (the Android app is on the way). Isn’t this a much better option than the endless amounts of location-based bait dropped in the faint hopes of catching new connections? Why, in a world of Sonar (and similar apps), are people still sharing insignificant check-ins across multiple platforms? If ignorance was the excuse, I hope you’ll reform your bad habits. If you have another reason, for the love of God, please share it in the comments section on this post. Just don’t post your rants on Twitter. My feed is already crammed with worthlessness. 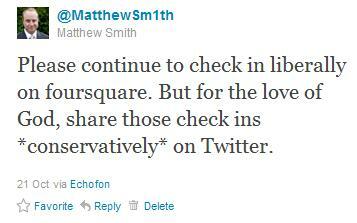 Coming tomorrow – proof that I’m a hypocrite: the Foursquare check-ins I approve of sharing across social media networks.